Rubber Seals for Fluid and Hydraulic Systems is a comprehensive guide to the manufacturing and applications of rubber seals, with essential coverage for industry sectors including aviation, oil drilling and the automotive industry. Fluid leakage costs industry millions of dollars every year. In addition to wasted money, unattended leaks can result in downtime, affect product quality, pollute the environment, and cause injury. Successful sealing involves containment of fluid within a system while excluding the contaminants; the resilience of rubber enables it to be used to achieve these two objectives and create a tight sealing effect. A sound understanding of the complex factors involved in successful fluid sealing is essential for engineers who specify, design, operate and maintain machinery and mechanical equipment. 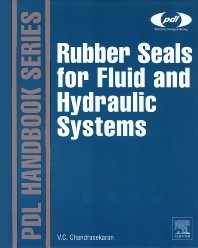 This book focuses on the characteristics of rubbers as seals, their manufacturing procedures, the implications of their physical and chemical characteristics for the sealing function in the fluid and hydraulic systems, how rubbers seal and prevent leaks, what properties are required for sealing function, and how they change before and after installation. The chapter on Manufacture of Seals and ‘O’Rings includes approximately 25 workable starting point formulations based on different rubbers, with cure and property data of those formulations as guidelines for technologists and engineers. Chemists in the discipline of rubber science and technology; engineers in the field of chemical, mechanical, nuclear, oil field and aviation engineering; teachers, students, research fellows and practicing professionals in several fields of science and technology; buying and marketing professionals in various engineering sectors.